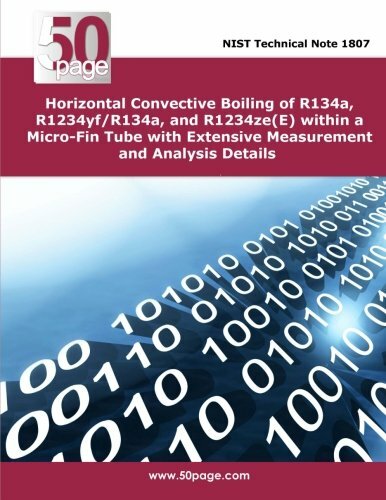 This report presents local convective boiling measurements in amicro-fin tube for R134a and two low global warming potential (GWP )refrigerants: R1234yf/ R134a, 56/44 % mass and R1234ze(E). Water heatingeither in counterflow or in parallel flow with the test refrigerant was used to varythe heat flux for a given quality. The heat transfer coefficient of the three testfluids were compared at the same heat flux, saturated refrigerant temperature,and refrigerant mass flux using an existing correlation from the literature. Theresulting comparison showed that refrigerant R134a exhibited the highest heattransfer performance in large part due to its higher thermal conductivity ascompared to the tested low-GWP refrigerants. For the example case presentedhere, the heat transfer coefficient for R1234yf/ R134a (56/44) remains within 5 %of the heat transfer coefficient for R134a, having essentially identicalperformance for qualities less than 30 %. The heat transfer coefficient forR1234ze(E) is roughly 700 kW,K-1,m-2 (approximately 14 %) less than that ofR134a for qualities greater than 30 %. The smaller heat transfer coefficient ofR1234ze(E) as compared to that of R134a is primarily due to the 11 % smallerthermal conductivity and the 21 % smaller reduced pressure as compared toR134a at this test temperature. The measurements are important as part of theevaluation of low-GWP replacement refrigerants for R134a in unitaryrefrigeration and air-conditioning equipment.